BBC Radio Leicester's Richard Rae describes the moment Lewis Hill hits a single to give Leicestershire their first win in the County Championship since September 2012. The Foxes, who beat Essex by six wickets at Chelmsford, had gone 993 days without a victory in four-day cricket. 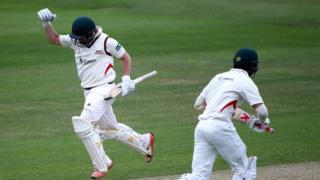 Leicestershire became the first side since World War Two to go two entire County Championship seasons without winning.